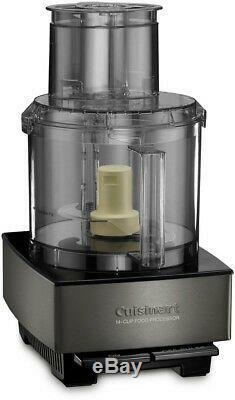 Cuisinart Black Stainless 14-Cup Food Processor. 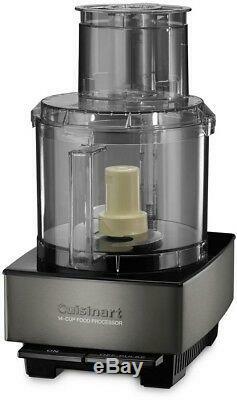 Cuisinart makes cooking for crowds easy and fast with the Custom 14-Cup Food Processor. Made from brushed stainless steel, this sleek kitchen workhorse is a breeze to use and will whir through prep and cooking with ease. Whether you are making a weeknight meal or a weekend celebration, the large capacity work bowl will hold everything as the 720-Watts motor makes quick work chopping whole fruits and vegetables, shredding cheese or kneading dough. Extra-large feed tube slices whole fruits and vegetables. Powerful enough to knead bread dough with ease. Stainless steel medium slicing disc (4 mm). Stainless steel shredding slicing disc. Easy to use and clean. : 12.5 in Product Height in. : 16.5 in Product Width in. : 9.25 in Appliance Type: Processor Blade Material: Stainless Steel Color/Finish: Black Stainless Steel Color/Finish Family: Black Stainless Steel Detachable Spindle: Yes Dishwasher Safe Parts: Yes Features: No Additional Features Full-Size Feed Tube: Yes Locking Lid: Yes Product Weight lb. The item "Cuisinart Black Stainless 14-Cup Food Processor Spatula Stainless Steel Powerful" is in sale since Friday, December 28, 2018. This item is in the category "Home & Garden\Kitchen, Dining & Bar\Small Kitchen Appliances\Food Processors". The seller is "onlinehomeimprovementdeals" and is located in Phoenix, Arizona. This item can be shipped to United States, Canada, United Kingdom, Denmark, Romania, Slovakia, Bulgaria, Czech republic, Finland, Hungary, Latvia, Lithuania, Malta, Estonia, Australia, Greece, Portugal, Cyprus, Slovenia, Japan, China, Sweden, South Korea, Indonesia, Taiwan, South africa, Thailand, Belgium, France, Hong Kong, Ireland, Netherlands, Poland, Spain, Italy, Germany, Austria, Bahamas, Israel, Mexico, New Zealand, Philippines, Singapore, Switzerland, Norway, Saudi arabia, Ukraine, United arab emirates, Qatar, Kuwait, Bahrain, Croatia, Malaysia, Brazil, Chile, Colombia, Costa rica, Panama, Trinidad and tobago, Guatemala, Honduras, Jamaica, Viet nam, Uruguay, Dominican republic, El salvador.